Purchasing Managers’ Indices (PMI) represent the primary, quickest and most reliable indicators of economic growth that are used across the world. 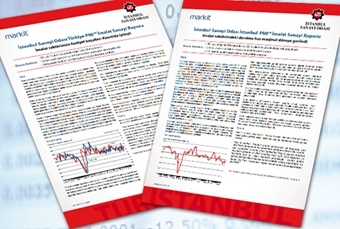 The Istanbul Chamber of Industry announces Turkey and Istanbul Manufacturing PMI data alongside the UK-based Markit Financial Information Services, which publishes PMI data in more than 30 countries. The Istanbul Chamber of Industry started to cooperate with Markit Economics in order to calculate the Purchasing Managers’ Index (PMI) in Turkey and disclose it to Turkish industrialists and economic circles on a monthly basis. As of September 1, 2015, the “Istanbul Chamber of Industry Turkey - PMI Manufacturing Industrial Report” has been issued under the Istanbul Chamber of Industry. Another outcome of this partnership is the “Istanbul Chamber of Industry Istanbul - PMI Manufacturing Industrial Report”, the world’s first city-based PMI published on a monthly basis.